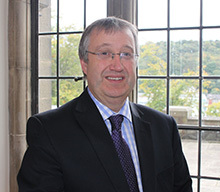 Kevin Mundy was appointed to Bangor University in 2002 as Director of Planning, following a career in a number of administrative functions at the Universities of Leeds and Sheffield. He was appointed University Secretary in 2014. Kevin is a member of the Executive, which is the University's senior management team, and is responsible for all functions of the Planning & Governance Office. He takes a lead role in strategic thinking, planning and policy development. He co-ordinates responses to, and liaison with, HEFCW on strategic and governance matters, including the Fee Plan, and is signatory of funding and data returns. He works closely with the Deputy Vice-Chancellor and other Pro-Vice-Chancellors and senior officers to deliver the University's efficiency and change management agenda. He is Secretary to the Executive, Council, Court, Strategy Committee, and Council Nominations & Governance Committees. As University Secretary he ensures an appropriate legal framework is in place to enable good governance to be exercised, advising the Council on the proper exercise of its powers, planning the forward programme of meetings of the Council and the Court, preparing agendas and co-ordinating the preparation of papers. He holds the University's Seal and oversees arrangement for documentation to be executed under the seal. He chairs the Compliance Task Group, the Aberystwyth-Bangor Shared & Collaborative Services Sub-Group, and the Business Intelligence Project Board and is a member of a number of other Task Groups. Kevin has line management responsibility for the Head of Planning & Intelligence, the Head of Compliance, and the Head of Strategic Partnership Development.